Second-year law student Megan Meyerson shows the Build Your Character app for College of Law students. College leaders say the app will give students a way to demonstrate skills to potential employers. This fall, the University of Nebraska College of Law will unveil a sort of “Fitbit” for aspiring lawyers: A smartphone app where students track progress on skills needed for successful lawyering. The app is the latest wrinkle in the college's comprehensive efforts to teach professional skills to budding lawyers. Junior and senior students in the Jeffrey S. Raikes School of Computer Science and Management developed it for the College of Law. The app, available on the web as well as Android and iOS devices, will be provided to law students when they arrive for orientation beginning Aug. 17. The app is part of a program that is helping put the College of Law in the national forefront of efforts to implement new American Bar Association standards for accreditation, said Colleen Medill, a professor who heads a college committee charged with implementing and compliance with the new standards. The innovative approach builds upon national research that began more than a decade ago, when University of California, Berkeley, professors Marjorie Shultz and Sheldon Zedeck identified 26 key traits and abilities for successful lawyers. The college also sought the input of more than 70 area attorneys and judges by conducting focus groups to learn which skills new lawyers might be missing. The resulting list included items like listening, client counseling, time management, document drafting, public speaking and courtroom presence, and law office management, among others. Molly Brummond, assistant dean for student and alumni relations, said the college got permission from Shultz and Zedeck to use their “effectiveness factors” as the basis for a new program called “Build Your Character.” Following Shultz and Zedeck’s lead, the college groups skills into eight general categories: intellectual and cognitive; research and information gathering; communications; planning and organizing; conflict resolution; client and business relations; working with others; and identity. Two years ago, faculty and staff conducted a comprehensive review of classes, co-curricular and extracurricular activities, tagging each item according to the skills it builds. For example, International Perspectives in the U.S. Legal System, taught by professors Brian Lepard and Matt Schaefer, is tagged as teaching case analysis, statutory analysis, applied problem solving, client counseling, legal drafting, negotiation, the ability to see legal problems holistically, and cultural competency. Leopard is Harold W. Conroy Distinguished Professor of Law and Schaefer is Law Alumni Professor of Law. The next step was to develop a convenient and meaningful way for students to track their progress. The college turned to the Raikes School. 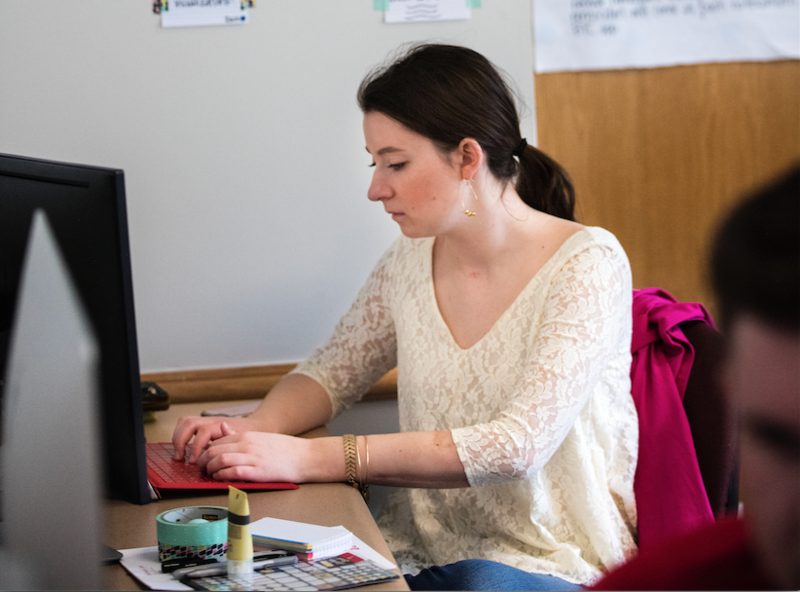 A team of upperclassmen in the school’s Design Studio – a capstone course during which students develop software for clients – created the Build Your Character app. The Raikes School is a selective program in which top computer science and business students live and work together. The BYC app was one of 15 software projects developed by its students in 2015-2016, said Ian Cottingham, an assistant professor of practice who directs the Design Studio. Raikes School student Sydney Goldberg, the project manager for the app development team, said its features include a news feed of law school events and information, a fully integrated calendar that syncs with a student’s personal calendar; law-related organizations to join; and classes that promote the skills a student wants to augment. Second-year law student Megan Meyerson of Lincoln said the app would make the Build Your Character program more user-friendly. She volunteered to help when she heard an app-building effort was underway. The app will give students a way to demonstrate skills to potential employers, Medill said. It also will generate institution-wide data that the College of Law can use to document learning outcomes for ABA accreditors. One of Goldberg’s duties as project manager was to make sure the app met the needs of the college and students. The senior marketing major said the app is more than a scheduler – it can help students get the most from their law school experience and prepare for their future career. “We’re absolutely at the forefront of education in terms of professional skills development,” Medill said. Sydney Goldberg, a student in the Raikes School, works on the Build Your Character app. The Design School team that developed the app hold cookies that look like the Build Your Character logo. 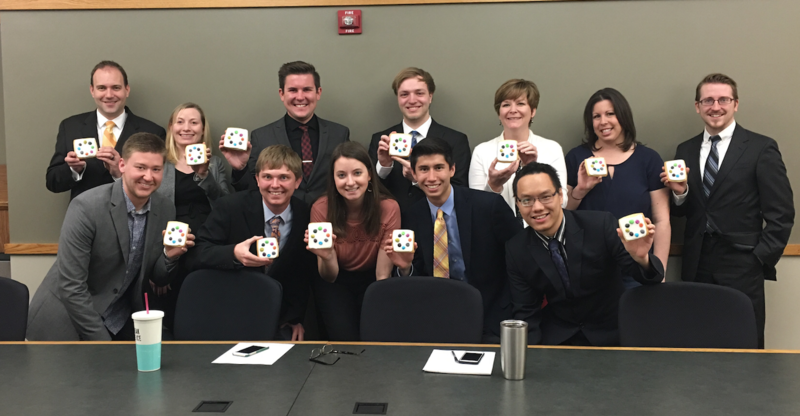 Back row (left to right): Ian Cottingham, Stephanie Mahlin, Patrick Luddy, Ian Howell, Molly Brummond, Amber Wolff, Eric Sinovec. Front row (left to right): Zach Christensen, Cooper Knaak, Sydney Goldberg, Ryan Long, Quan Tran.